Dutch musician Benjamin Herman began playing saxophone at 13 and performing for audiences less than a year later. At 21 he received the Wessel Ilcken prize for Best Young Jazz Musician of the Year. Shortly thereafter he was invited to take part in the 1991 Thelonious Monk Competition, along with Joshua Redman, Chris Potter, and Eric Alexander. In 1994 he founded New Cool Collective—Holland’s hottest big band—an ensemble that blends salsa, punk, Afrobeat, free jazz, and surf music. 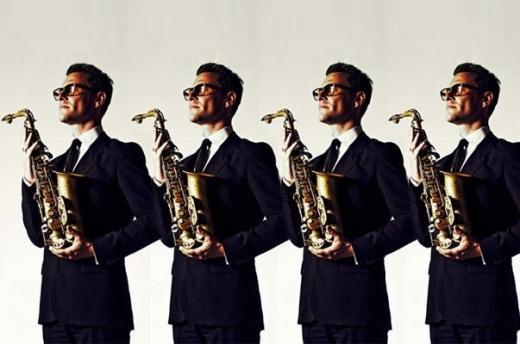 With NCC and with his quartet, his gigs are inspired by the popular jazz of the dance floor, appealing to a broad cross-section of music aficionados. At the same time, he has explored the repertoire of composers such as Thelonious Monk, Jaki Byard, and Misha Mengelberg, the iconic co-founder of ICP Orchestra, a groundbreaking Dutch group whose members include Han Bennink, Wolter Wierbos, and Ab Baars. Besides releasing two recordings of Mengelberg’s music, Benjamin has appeared on over 100 albums as a sideman or leader with artists as diverse as Candy Dulfer, Idris Muhammad, Georgie Fame, and Metropole Orkest. He is the winner of several Edison awards (the Dutch Grammys) and was named Best Dressed Man of 2008 by Dutch Esquire magazine. Herman’s quartet features some of Holland’s finest players. Bassist Ernst Glerum has worked with Steve Lacy, Lee Konitz, Han Bennink, John Zorn, and ICP. Guitarist Anton Goudsmit, who has worked with Tony Allen, Han Bennink, and John Zorn, is a founding member of the Ploctones, a group that melds rock, jazz, funk, and other seemingly disparate genres. Drummer Joost Patocka performs with the Beets, Carolyn Breuer, Ernst Glerum, Jazz Cats, and Five Up High.